The Final Countdown Slot Review - Danger High Voltage 2 IS HERE! With the massive boom in Megaways slots, Big Time Gaming appears to be getting topped at its own game. Moreover, online casinos are constantly being overrun by absolutely amazing Megaways slots developed by providers such as Blueprint Gaming, Red Tiger Gaming, Kalamba Gaming. Well, it’s about time for Big Time Gaming to step up in their own game. Lately, there has been a lot of buzz around their upcoming project, Danger High Voltage 2. While Big Time Gaming kept it low-key for a while, it’s finally out there. With that being said, here’s their latest slot – The Final Countdown AKA Danger High Voltage 2. 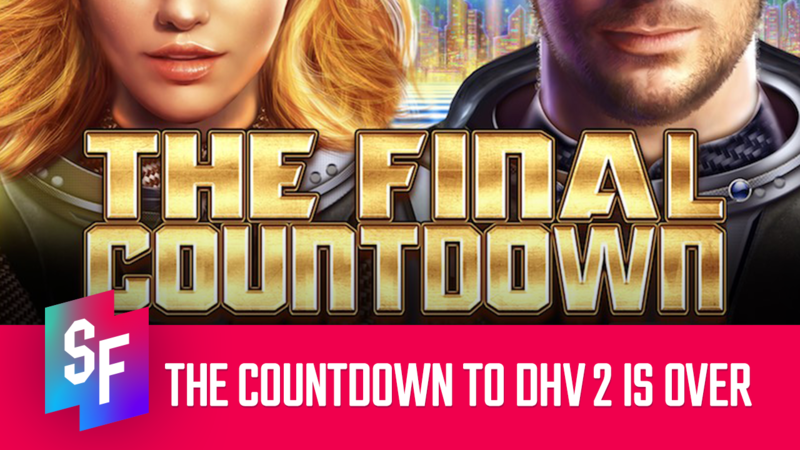 So, let’s not waste any more time and get right into this The Final Countdown slot review. If you have listened to Europe’s “The Final Countdown” a couple of times, you will instantly recognize the intro upon your first spin. Over time, it begins to feel slightly repetitive. It even may seem as if the song is about to drop and it never does after a couple of minutes. The first Danger High Voltage slot was not as irritating when it came to the sounds. As is typical for BTG slots, this game is highly volatile, and the bonus takes some time to trigger. So, if you are here for the song, better mute the slot and play it on loop in the background instead. However, it’s certainly not the soundtrack that brings the players to the yard. It’s the next Big Time Gaming slot. Atypical to the song or the slots’ predecessor, the design follows a sci-fi theme. Visual elements of the slot represent a countdown, hence the song, for a space flight event. First thing’s first, the grid layout is set at six-by-four, along with 4096 ways to win. 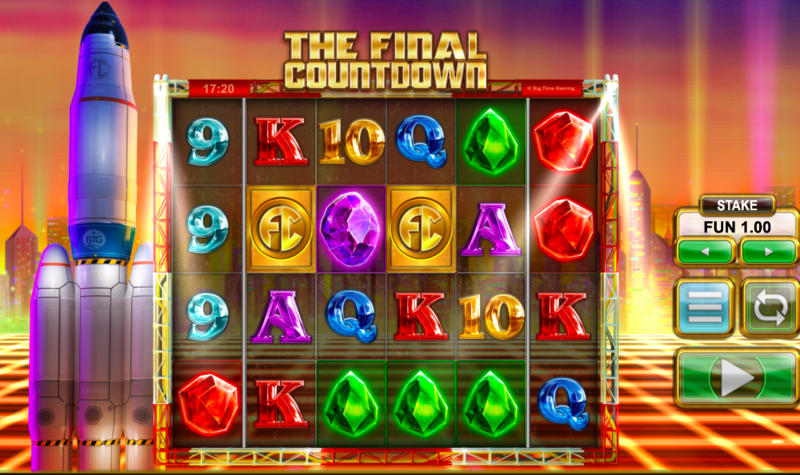 The Final Countdown slot has a total of 10 symbols – four high-value and six low-value. The highest paying symbol with a combination of six can pay a total of 25X. Whereas, three pairs of the lowest paying symbol can pay out a 0.4X times the bet. Additionally, the scatter symbol is also a paying symbol that can pay a 100X with a 6-piece combination. The bet size ranges between €0.20 and €20. Moreover, the maximum win potential stands at a whopping 36,000X. One of the core mechanics for the game is the Reel Clone, which is a somewhat similar feature as seen in many other BTG slots, such as Queen of Riches. Basically, between reel two and five, the Reel Clone can produce two to four identical reels, having the same symbols with the same positioning. However, worthy of note is the fact that scatters can also be cloned. On top of that, there’s also Clone Wilds. They land as regular symbols. However, they may expand across reels and rows. If a Clone Wild extends to four reels, it can multiply all connecting winning combinations by 256X. When it comes to the bonus, you need three or more scatter symbols to receive the free spins bonus feature selection. There are two options – The Countdown and Heading For Venus. The Countdown awards eight free spins. In this bonus, the player receives a Roaming Wild that starts with a 4X and expands in size between reels 2 to 5 on each retrigger. It can go up to 256X, similar to the base game. To retrigger, the player needs to reach the very end of the countdown. It starts at 10. The scatter symbols now work as a regular paying symbol. To help with the countdown reduction and retrigger potential, each scatter symbol reduces the countdown by three. Overall, this option is solid if you are looking for that one huge hit. Heading For Venus awards the player 15 free spins. In this feature, the Reel Clone occurs on every spin. Three or more scatters can retrigger the feature. Now, what is unique to this bonus feature is the Velocity Wild. The velocity wild stays within the Reel Clone area and can grow from 4X and up to an 888X at random. This option can be highly unpredictable, compared to The Countdown. However, an 888X multiplier wild can make an insane impact. 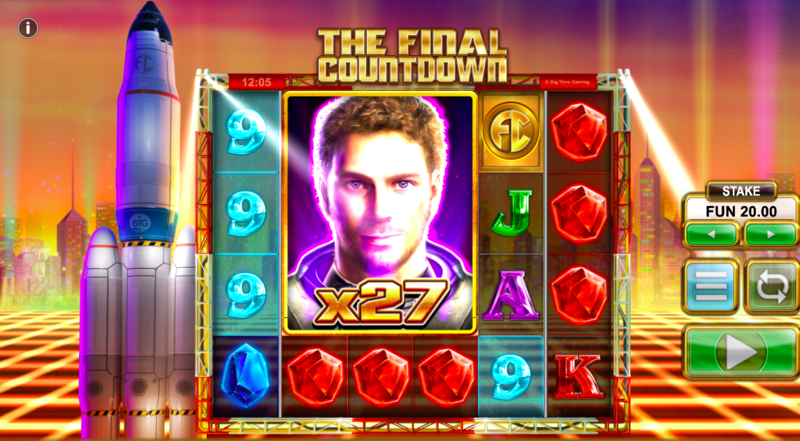 All in all, The Final Countdown slot is looking like one of the better releases from Big Time Gaming so far. Compared to Holy Diver, this slot seems a lot more promising. While it’s difficult to say whether this is everything we had hoped for since the project carried the name of Danger High Voltage 2. Nonetheless, The Final Countdown carries its name and despite the buzz of its alleged prequel, bears a whole new vibe to it. This slot has everything you would expect from Big Time Gaming with the volatility, an insane win potential, wicked multiplier wilds. Go try out this slot but tread lightly – time is money, and the countdown is not as slow as you think it may be.